Amdocs (NASDAQ:DOX) has the type of strong, recurring cash flow stream that is normally highly valued by Wall Street. However, by looking at the valuation of Amdocs one would never know this. Excluding net cash (Amdocs has over $9 a share in cash), Amdocs trades at a roughly 10% trailing free cash flow yield and a little over 10 times forward earnings estimates. Higher One generates roughly $40 million a year in free cash flow & trades at 3 times FCF. Higher One has issues than can be worked through. If Higher One can work through these issues it could be a $10 stock again. Higher One (NYSE:ONE) operates in two related lines of business. Higher One's first line of business is providing software to universities. One of their software tools facilitates the transmission of financial aid to students. Financial aid is paid directly to the university from the government & private lenders. The universities take out tuition, room & board and then give the remaining amount to the student. Higher One's software facilitates these transfers and the processes associated with them. Roughly 35% of revenue comes from their software. Higher One's second line of business is related to the software they provide for the transmission of financial aid. A student can choose to get their financial aid money in an ACH transfer to their bank account or receive a check. A third option is to open a Higher One account, mainly for students that do not have bank accounts. Higher One partners with banks to provide students with a debit/ATM card so that they could access their financial aid money. Roughly 65% of revenue comes from the Higher One account. There are numerous ways Higher One earns money through their Higher One account. 45% of Higher One account revenue comes from interchange fees, which is the money merchants are charged when somebody uses their Higher One card to buy something. The other 55% of revenue is earned on fees charged to the student. These are typical fees banks charge such as a $2.50 fee for using the ATM of other banks rather than the ATMs provided by Higher One. Higher One has an extremely profitable business. Over the past few years Higher One has generated roughly $40 million a year in free cash flow excluding the construction costs of their headquarters, which is completed, and similar onetime costs. Higher One is on track to produce a similar amount of cash this year excluding a onetime $15 million payment to settle a lawsuit. The Federal Reserve has told Higher One that they will seek up to $35 million from Higher One for misstatements & omissions related to the marketing of the Higher One account. Higher One believes they will be responsible to pay the FDIC an equal amount so the potential liability is $70 million. Currently the two parties are in negotiations. Higher One has taken a charge of $8.75 million relating to this matter but it will likely cost them more. Higher One has ample free cash flow to cover a $70 million fine over time, even though the ultimate fine is unlikely to be that high. The issue is that Higher One has $16 million in cash and owes $94 million on their credit line. Paying a large fine would put Higher One in breach of one of their debt covenants. Additionally, they may need to borrow more money to cover the fine. Higher One's management says that their lenders want to work with them but want to know the amount of the fine first. I believe the fine by the Federal Reserve is the biggest risk to Higher One as their destiny is not in their own hands. With that said, the most likely outcome is that Higher One's lenders work with them. It does not make any sense for Higher One's lenders to force a default. Higher One is not highly levered and is producing a lot of cash. I believe Higher One will have close to $40 million in cash by year end. The Department of Education (DOE) is attempting to make new rules concerning student bank accounts. The earliest these rules will come into effect is July 2016 if they are passed by November 2015. This year's rule making session ended without a vote as banks don't believe the Department of Education has the right to govern them. They believe any rules should come from their regulators. It is possible that this fight ends up in court and it takes years, if ever, for the new rules to come into effect. The good news for Higher One is that for the next 2 years their ability to continue to generate cash is unlikely to be impeded. The original rule changes proposed by the DOE were draconian and would have been a tremendous hit for Higher One. The DOE proposed forcing banks to give students two free ATM withdrawals a month at other bank ATMs and curbing debit card fees. By the time the rule making session was over the DOE was open to allowing Higher One to charge ATM fees as long as they joined a larger ATM network. This would cost some money but ultimately is unlikely to hurt profitability much. Higher One may have to remove debit card fees but is seeking offsets to the debit card fees. The bank lobby is fighting tooth & nail against the DOE regulating them and the bank lobby doesn't want to make any concessions. I would be surprised if anything passed but in the investing community I seem to be in the minority. The bank lobby also has the tools to punt this issue to the next administration by suing the DOE. The private colleges have delayed regulations by the DOE with lawsuits. There is a lot of hyperbole directed at Higher One as an evil company that profits at the expense of students. In reality Higher One largely charges fees similar to their competitors. The two fees that critics are loudest about is the ATM fee & the debit card fee. Higher One charges $2.50 for using a competitor's ATM. Bank of America and Wells Fargo both charge $2.50, while Chase charges $2. Why this makes Higher One evil is beyond me. Higher One charges 50 cents when using the debit card. However, the fee can be avoided by simply selecting credit when the cashier asks "debit or credit". I used to use a Chase debit card. But once the Fed limited debit card interchange fees Chase started charging me $15 a month to use my debit card. Their intention was to make me switch to credit so they can collect a higher interchange fee from the merchant, so I switched. All the student needs to do is to say credit to avoid the 50 cent fee and Higher One will earn their money from the merchant instead. And 50 cents is a lot better than $15 a month. Higher One should be able to cut at least $10 million in costs. General & administrative costs as a percent of revenue have risen from 21% a few years ago to 28% today. This is partially due to merger integration costs and partly due to increased professional fees in related to the outstanding regulatory issues. The merger integration should be completed some time in 2015. Eventually the regulatory issues will be settled as well. Higher One management says that all costs are on the table. I suspect there are many costs to cut as Higher One was once a hot "payments" company that built themselves a fancy headquarters. I see no reason G&A can't go back down to its historical level which would save over $15 million a year. This would likely more than offset any revenue hit from new rules by the DOE. Higher One is not without risk. It is possible their lenders or the government will put them out of business. This outcome is unlikely as it does not make sense for lenders to bankrupt a company that is able to pay. Debt covenant waivers are granted all the time and that is the most likely outcome here as well. The government doesn't generally put real companies providing a real service out of business. Despite the hyperbole Higher One provides a needed service for a similar price to its competitors. If Higher One can get through this mess at their current earnings level the company can one day trade at $10 again and be a multi-bagger. Crimson has a stated book value of $8.12. However, this does not take into account the value of two of Crimson's most valuable estates. Crimson acquired Pine Ridge in 1991 and Archery Summit was started in 1993. These two estates are carried for next to nothing on Crimson's book due to GAAP accounting. In 2001 these two estates were put on the market for $150 million as seen in this Wine Spectator article. It makes little sense that they are assigned almost no value. Napa Valley estates trade at record prices and at significantly higher prices today than they did in 2001. It is estimated that the Araujo Estate in Napa recently sold for over $100 million (or $2,630,000 per acre) . Araujo, has 38 acres and produces approximately 6,000 cases a year. Inglewood Estate, recently sold for an estimated $20 million (0r $666,000 per acre). Inglewood has 30 acres and produces 5,500 cases. The new owners are rebranding the estate suggesting weakness of the Inglewood brand. Pine Ridge, which is located in Napa, currently produces 80,000 cases a year and has 168 acres. Pine Ridge has an additional 46,000 cases of capacity. Inglewood'd brand is clearly is clearly inferior to that of Pine Ridge. At Inglewood's valuation ($666.6 k per acre) Pine Ridge would be valued at $112 million. At Araujo's valuation ($2.63 million per acre)Pine Ridge would be worth $442 million. The answer to Pine Ridge's valuation likely lies somewhere in between. I believe that Pine Ridge alone could be sold for at least $200 million. Archery Summit is the premiere estate in Willamette, Oregon. Archery Summit has 100 acres and produces 15,000 cases a year. Archery Summit is able to charge $150 for its Pinot Noir, far more than any other winemaker in the region. I estimate the value of Archery Summit to be $20 million. Crimson's purchased its three other estates in recent years. Seghesio was bought for $86,000,000 in May 2011 and is located in Sonoma. Since then the value of Sonoma estates have risen significantly. Additionally, Crimson expanded capacity and has grown sales at Seghesio. Seghesio would likely sell today for over $100 million. Chamisal was bought for $19,200,000 in August of 2008. The purchase price of Double Canyon in 2005 and 2006 was undisclosed but I estimate it to be worth at least $10,000,000. Crimson recently sold land that it was not using at Double Canyon for 70% above book value. It is possible that even the land that Crimson bought in recent years is being carried drastically below market value. Adding my estimated land value to the $30 million in cash & investments Crimson will likely have at the end of this quarter yields a tangible book value of roughly $15.50, or a price 75% higher than the current quote. Dow Chemical announced that they will repurchase $4.5 billion worth of stock over the course of 2014 amounting to roughly 8% of the float of the stock at the current price. The vast majority of this repurchase will be done with borrowings as there will likely be very little cash left over after capital expenditures and dividends. Share repurchases of this size are generally very bullish for the near term performance of a stock but there is more than meets the eye to this repurchase. In 2009 Dow issued a total of $4 billion in convertible preferred shares to Berkshire Hathaway and Saudi Aramco (SA) in order to complete their acquisition of Rohm & Haas. These shares pay a preferred dividend of 8.5% and have a strike price of $41.32. It is unlikely that Berkshire or SA will opt to convert these shares because of the hefty dividend and the value of the call options. However, this large dividend is burdensome to Dow and Dow can force conversion if the common stock price exceeds $53.72 per share for any 20 trading days in a consecutive 30-day window. I believe this share repurchase is essentially a risky gambit to force conversion of these preferred shares. If this plan is successful then there will actually be more shares outstanding following the plan than before the repurchase. On the surface this plan appears to be sound as it removes burdensome preferred shares paying an 8.5% dividend and replaces it with cheaper debt. The risk is that the plan fails (ie. Dow can’t force conversion) and that Dow enters the next down cycle with an additional $4.5 billion in debt, the burdensome 8.5% preferred and an enormous pension gap that would likely balloon further. It seems that Dow has the debt coverage ratio to take on the additional debt but that ignores the gaping pension hole and the likelihood that EBITDA would contract dramatically in a cyclical downturn. I am not predicting a cyclical downturn but noting the risks if it does occur. My experience with share repurchase of this size is that they are positive for near term performance even if they are not in the best long term interest of the company. However, once the stock price approaches $53.72 Dow becomes a compelling short. In addition to the very rich valuation there would likely be enormous selling pressure at that price. At that price Berkshire and SA would need to start selling down shares unless they want to be owners of Dow Chemical stock. If Berkshire & SA sold down their stake it would amount to over $5 billion, greater than the amount of the Dow repurchase. It is also possible that funds aware of this situation would sell ahead of that price. Dow Chemical is one of five chemical stocks I am short against Eastman Chemical, a stock I believe is far more attractive. As a result of the share repurchase announcement I covered a portion of my Dow short despite the fact that I believe shares are overvalued. I don’t want to stand in front of an 8% repurchase as there is no money in being a martyr and I want to be in a position to short with reckless abandon if the shares approach $53.72. Dow Chemical is one of five chemical stocks that I am short against a long position in Eastman Chemical, a security that I believe is far more attractive (I explain my long case for Eastman in this article). In light of the Third Point letter on Dow Chemical I want to explain why I view shares of Dow as relatively unattractive. 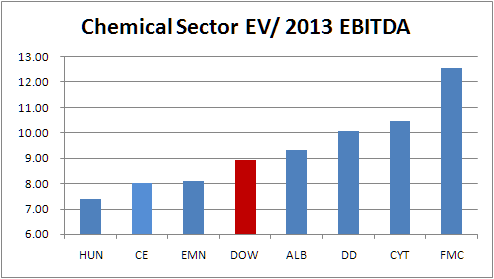 Dow Chemical trades at an expensive valuation compared to its chemical sector peers. 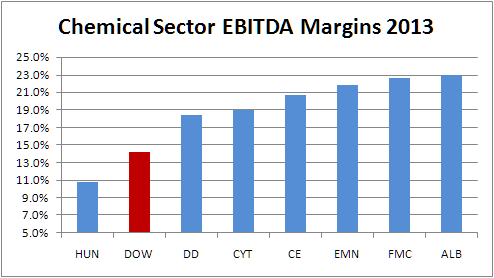 As seen in the charts below, Dow has one of the lowest EBITDA margins in the chemical sector yet trades in the middle of the group in terms of valuation. This comparison is generous to Dow as it ignores Dow’s $9 billion unfunded pension liability. If one includes the pension deficit in Dow’s enterprise value than EV/EBITDA is roughly 10 times. This adjustment puts Dow squarely in the high end of valuation versus its chemical peers despite a low quality mix of businesses. An analysis based on P/E ratios would make Dow look even more expensive. The Third Point letter points to “cost cutting and operating optimizations that could amount to several billion dollars a year in annual EBITDA”. Dow Chemical has announced multiple restructurings & layoffs over the years leading to the lowest SG&A/sales ratio in the chemical sector. Dow’s SG&A is only 5% of sales. This suggests limited room for margin improvement through cost cutting. Where else will the cost cutting come from if not from SG&A? Are they running their crackers inefficiently? Are they selling commodities at below market prices? The Third Point letter gives no details of what operating optimizations could save billions so it is difficult for me to refute that point. However, later in the letter Third Point complains about “poor segment disclosure combined with Dow’s opaque and inconsistent transfer pricing”. This is seemingly contradictory. If Dow’s disclosures are poor, than how can Third Point be certain these optimizations are possible? Justifying a high price target for Dow Chemical involves placing a premium multiple on every business line (while ignoring the pension deficit). If one takes any diversified chemical company and puts rich multiples on every segment than all of them will look cheap, with tremendous upside. There is no reason to believe that Dow will achieve these rich multiples. Proponents of Dow point to spin offs and asset sales. It is unclear to me why spin offs will help Dow as their blended businesses already trade at relatively high multiples. Axiall, which is the comp for the business Dow is planning to spin off, trades at only six times EBITDA. Dow owns numerous low margin, commodity businesses that deserve to trade at low multiples. With Dow trading at roughly 10 times EBITDA (including pension) that means that the rest of Dow trades at well over 10 times EBITDA. Secondly, why would these spin-offs trade for best of breed multiples if they don’t perform like best of breed businesses? Significant asset sales seem like a pipe dream as well. Dow and Dupont are the two largest US chemical companies. Both have activists and both are looking to sell assets. If the two largest companies are sellers, who will the buyers be? It is possible that Dow and Dupont will find buyers for some businesses but any sales are unlikely to be significant to either company. Dow Chemical appears to be among the most overvalued chemical companies relative to its peers. Spinning off a business is not a magic elixir that turns around a business. There are higher quality companies with great managements available at cheaper multiples (see Eastman Chemical). A fixer upper is not always a great deal and can often be a money pit.